When you set up this printer you quickly find out why it won the PC Editors Choice award – it doesn’t take long from the time you open the box until you are making great prints. From the time I got all the wrapping paper and tape off of it until the time I was making my first print was about 10 minutes on Windows 7. When I tried to install it on my Macbook Pro some of that work done on Windows could be leveraged so I end getting it working in less than 5 minutes. Out of the box, both Mac and PC printed perfect color matched prints from Photoshop CS6 that were identical despite being printed from different computers and operating systems. The Epson Ultra Premium Luster and Epson Premium Semi-Gloss are a great photo papers and great profiles are included with the printer to get you productive in a hurry. In fact, I had no trouble printing 4x6”, 8.5x11” (Letter), or 13x19” prints and I even threw on a 13” roll of luster with no hassle for good measure. This is how printers are supposed to work! This printer features the same ink set as the legendary Epson Stylus® Pro 3880, but it is a higher resolution printer featuring the same AccuPhoto HD2 imaging technology as the 4900. This coupled with its roll support, smaller droplet size, and overall user-friendliness – I’m seeing why this printer has been so well reviewed – it’s pretty awesome! I won’t jump into all of the stats as you can do that elsewhere online, but I’ll say at a high level I’ve been impressed with how this printer matches the quality of my trusty Epson Stylus Pro 3880. Visually I can see the difference in image quality in both color and black and white prints printed with Photo Black Ink. As of the time of this article I haven’t done any Matte Black Ink comparisons, but if I notice any differences I’ll be sure to add them here – I don’t expect any based on my printing experience. One thing I was very pleased with is that the included paper profiles from Epson were very well done to match the 3880 as really it’s the paper profile more than anything that gets you accurate color. The strength of Epson is certainly accurate color that matches what you have on a calibrated display (like my NEC PA Series), and despite this printer lacking the “Pro” moniker, it certainly prints pro quality prints. With an identical ink sets, but better screening technology (found in the 4900), smaller droplet size, and a greater resolution I expected that the R3000 might even have better print results. However, in my testing everything that I printed from both the 3880 and R3000 appeared identical to my eyes. To be fair, I’ve taken a break from printing over the summer so my eyes aren’t as attuned to noticing print differences as they were during my printing series, but I certainly think that the average person would say the prints are identical and I’d say that’s a good thing. With this in mind, I still wouldn’t give up my 3880 because I still enjoy its ability to handle larger 17x22” sheets which I feel it does better than even the 4900 (especially since the 4900 can’t do borderless on cut sheet media). I also prefer its larger ink cartridges which save money in the long run. Speaking of the 4900, I’m also pleased to report that I haven’t had any challenges printing even margins with my R3000 (or 3880) like I did with the 4900. It just works as expected without having to jump into any special printable area dialogs. If you don’t need to do cut sheets bigger than 13” wide then the R3000 makes more sense than the 3880 for many reasons, so don’t mistake this for a lesser product. Yes, it’s true that the R3000 does print on 13” wide rolls, but if you are spoiled with roll printing from larger printers like the 4900 and up then you might be disappointed. The reason why I was disappointed was because you get used to features like built-in cutting on the 4900 which doesn’t exist on the R3000 (you have to cut it yourself using a cut line that the R3000 will print). I was also disappointed that when I ejected my roll there wasn’t a way for the printer to mark the roll with a code so that I could reload easier next time and know how much paper was left (a 4900 feature). Finally I found the flimsy roll holders on the back with the paper exposed to the elements as a bit of an after thought design rather than one I’d really want to use. So at the end of the day, yes it does roll paper and the prints are just fine. However, it’s definitely consumer grade roll printing from an ergonomics standpoint. This is fine if you are upgrading from a R2400 or older consumer printer, and of course it beats no roll support at all. It’s also an advantage over the 3880 because you can print banners on rolls (like panos or your kids Happy Birthday signs <g>). Outside of this though there’s been no problem whatsoever, so I love the wireless support. It makes the 3880 and 4900 feel dated and downright unfriendly! Honey, can I print from my iPhone? Epson iPrint immediately detected my printer and everything seemed to be rocking along fine. I was disappointed that it didn’t offer me more than two choices of papers, but I can live with that for phone printing. Once I got to printing everything was rocking along (albeit very slowly) until I decided to check my email. Apparently iOS 5 didn’t like that as my print job failed and I got an error from my phone telling me to clear the printer for any paper jams, turn it off and restart it. The truth seemed to be that the app just lost contact with the printer when it wasn’t the foreground app. So yes, it does print from your phone – but not via the native Print buttons (which require iPrint). You must install Epson’s iPrint app (only tested on an iPhone 4s running iOS 5 – not OS or cell phones). The quality wasn’t great, but it was acceptable. I saw this on Epson’s website and thought it was interesting, so you can check out this video to learn more about the R3000. My Epson contact told me a great story about how Epson engineers visited photographers to try to better understand what they really needed in an affordable printer. Much of what you find in the R3000 is the result of what they learned, but perhaps the most interesting feature is the top of the printer. In short, the top of this printer is really designed to hold paper boxes to help deal with the storage problem. This is great as I have a habit of putting paper boxes on my printers anyway, so I laughed when I found this out. Of course, should probably state the obvious that I wouldn’t go put the big huge box of plain paper you can get from Office Depot on this printer, but your normal size boxes of fine art paper and a ream of plain paper will do just fine on top. Epson says the R3000 is engineered as a result of direct feedback from its customers. I’m here to tell you that it shows as this is a great user-friendly printer. I love this printer and use it every day. I find myself printing more than ever and I’ve retired my Canon PIXMA MP560 Wireless Inkjet All-In-One Photo Printer that I picked up several years ago for only $79 on a Amazon Deal of the Day sale. I’m getting much higher quality print results that honestly have reduced my need to fire up my pro printers as often. I love doing 4x6 prints on this printer as that’s been something that has always been a headache on all of my printers (and the MP560 just flat out sucked). I can now do one at a time without having to break out the scissors or paper cutter, so when my wife says “can I get a print of that” I can say “sure, no problem” AND MEAN IT! Ever since I did my printing series I’ve said that every photographer should take the time to print their work more often. It’s a special experience that’s hard to describe when you hold your image on paper and it really does look better than on your screen. Taking the extra step to print it yourself and have control of the creative process from the moment of capture to the final output is even more special! It puts modern day photographers back on par with old film photographers who controlled their entire creative process, so it adds a new dimension of enjoyment to printing. This is not one of the cheapo printers I describe in the first chapter of my book – it’s the real deal, and an honest to goodness high quality printer capable of producing professional results. In short, I love this printer and highly recommend it! Please support this blog by buying your R3000 at Adorama, Amazon or B&H. There’s a $200 mail in rebate right now that expires on October 31, 2012 so it’s a great time to buy! The 3880 and 4900 have rebates too! 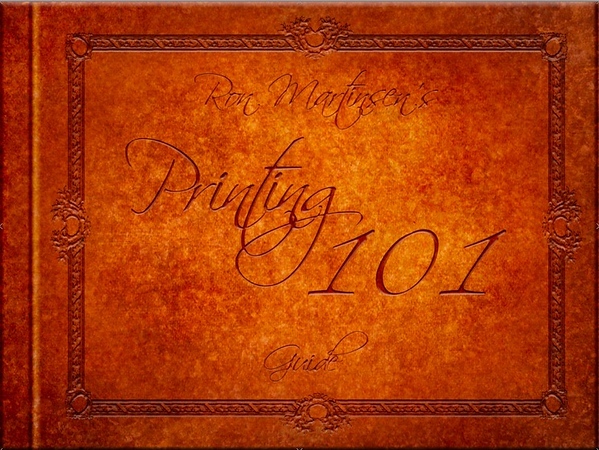 If you answered yes to any of these questions then you might find my Printing 101 eBook helpful. While it doesn’t feature anything about the R3000 printer, it does have a wealth of information about what’s involved with printing (sadly it’s not as easy as file print). Epson has provided me with a R3000, ink and paper for the purpose of doing a review. I am having problems with wacky, incorrect margins with the R3000 after sending a print job from Photoshop CS6 in Windows 7 64-bit, and so far after 3 phone calls to Epson have gotten no advice. My prints are pushed off to the left and top with margins of .12 on the left and on the top and wide margins on the right and bottom. There is apparently no way to center the print in the Epson software, even though though the Epson preview shows the print centered on its preview page. Any advice would be helpful, since it seems I'm doing all the talking when I've contacted Epson and I've gotten no help at all. So, it's that good huh? My Stylus Photo R1800 died on me and I loved that printer because we had a lot of good times together (I had it for 5 years). I'm thinking of either buying Canon Pixma Pro or another Epson. Any feedback on that? You might want to check out my PRO-1 review as well. Unless you plan on going up to the 7900, I think the R3000 is a great choice for many people. While I wish it had larger ink cartridges, it's got the print head performance of a 4900 with the ink of a 3880, so it actually outperforms the 3880 - except with thicker (> 11 mil) media. The PRO-1 is a great printer with dazzling black & white and no gloss differential issues, but its native color ICC profiles tend to be a little warmer than what is accurate. Some will find that to be very pleasing and satisfying, but purist will be frustrated. The PRO-1 is very, but it's very heavy and large too (bigger than 3880). I really want to start a business that focuses on making a custom design stickers for different automobiles as well as a business that caters t-shirt printing. What kind of printer should I buy and how much budget should I need to allot to it? Thanks! I see you are local, so I'd suggest you go see my friends at JVH in Bellevue. They actually have a digital print festival next week where you can also rub elbows with a lot of pro printers to get some tips. For outdoor signage, which is what bumper stickers effectively are, the general advice is to use solvent printers with vinyl sticker media. Those are very expensive printers though (> $10k) Depending on your volume, you might be better off outsourcing the printing and focus on the designs to maximize your profits. JVH would be a good resource to discuss the options though as this isn't an area I've got any experience with. I'm just wondering whether this printer could manage printing to any different types of photo papers. You know, will there be any quality differences? If I use silk paper over the glossy or when I use the leaflet type paper? I have the same issue as bubbie in the first comment left on this blog - error margins with the R3000 printing from Photoshop CS6. Do you know how that issue was resolved or can you please put me in touch with bubbie? I have the margine same issue. Have been wrestling with Epson support since October 2012. My margins were originally off by a lot. Epson said it's a known issue and sent me an unpublished driver (not from Apple). This improved the margins to what you are saying - one side is a couple of mm off. And it's still annoying. Today, an Epson tech informed me a couple of mm off is expected and within specification. Never use custom paper sizes and margins (unless you are using a a non-standard paper size. Use the built in paper sizes only. He said Epson signature worthy series paper is actually not measured exactly to size. It's larger to allow for shrinkage after ink dries - this could affect margins per Epson. They are sending me some free paper for my trouble. I want even margins. I just did an update check on my Macbook Pro yesterday and noticed they have a new Epson driver but I wasn't sure which one it was for. It seems like you are getting the run around so I'm sorry to hear about that. I think the shrinkage excuse is the biggest joke I've heard of yet - what a load of crap!